NEW ORLEANS (CNS) — For years during Mardi Gras, people in New Orleans have been accustomed to yelling, “Throw me something, Mister!” to encourage float riders in parades to toss them beads or trinkets. This year, the crowds will be yelling something different to riders on one float in the Mystic Krewe of Femme Fatale. As part of the 175th anniversary celebration of the Sisters of the Holy Family, an African-American congregation founded in pre-Civil War New Orleans by Mother Henriette Delille, 20 members of the religious order will ride down St. Charles Avenue in the Uptown parade Feb. 19. A “krewe” is a group or organization of revelers that bands together to host an event during the Mardi Gras carnival season in New Orleans. Dozens of parades take place from early January through Mardi Gras, or Fat Tuesday, which falls on the day before Ash Wednesday. This year Ash Wednesday is March 1. It marks the start of the Lenten season of prayer, fasting and almsgiving. Dressed in their regular veils, habits and wearing crucifixes, the sisters will be aboard a Femme Fatale float called: “175 Years Blessing New Orleans.” Traditionally, float riders are required to mask in costume. “We are their royal, honorary guests, so we don’t have to wear a mask or costume,” said Sister Greta Jupiter, congregational leader of the Sisters of the Holy Family. Riding in the parade is one of the congregation’s many activities during their yearlong anniversary celebration, which has as its theme “Proudly Celebrating the Past … Faithfully Committed to the Future.” The celebration will culminate with a closing Mass at St. Louis Cathedral and banquet in November. Sister Greta said the ride is historic. She and others believe this is the first time a women’s religious congregation has ridden in a parade as a group. The idea came about through a suggestion by the congregation’s 30-plus member anniversary committee as a way of spreading awareness of and devotion to Mother Henriette, a free woman of color who founded the congregation in 1842 to educate and care for slaves and the elderly at a time when teaching slaves was against the law. Sister Greta asked the krewe if the sisters could ride, and Femme Fatale president Gwendolyn Rainey jumped on the request. Mystic Krewe of Femme Fatale was founded in 2013 as a social group for women to build friendships and good fellowship. Rainey recalled how she attended summer camp at the former St. Raymond Parish where the Sisters of the Holy Family had once served. “This is a history-making moment,” she said. The sisters will throw special beads with a medallion on one side bearing the coat of arms of the Sisters of the Holy Family (1842-2017) and a 175th anniversary citation. 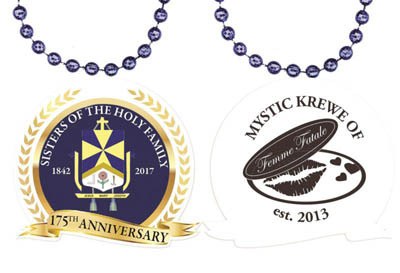 The flip side of the medallion will have the Mystic Krewe of Femme Fatale’s logo. The krewe had the medallion minted specially for the sisters, Rainey said. The participating Sisters of the Holy Family were eagerly anticipating their ride, even though some have previously ridden in parades — in the annual Krewe of Jingle Christmas parade sponsored by the Downtown Development District in New Orleans, and also in a parade celebrating the congregation’s 169th anniversary in the Treme area, passing places where Mother Delille served. “I’m excited to see Mardi Gras from the other side,” Sister Judith Therese Barial said. 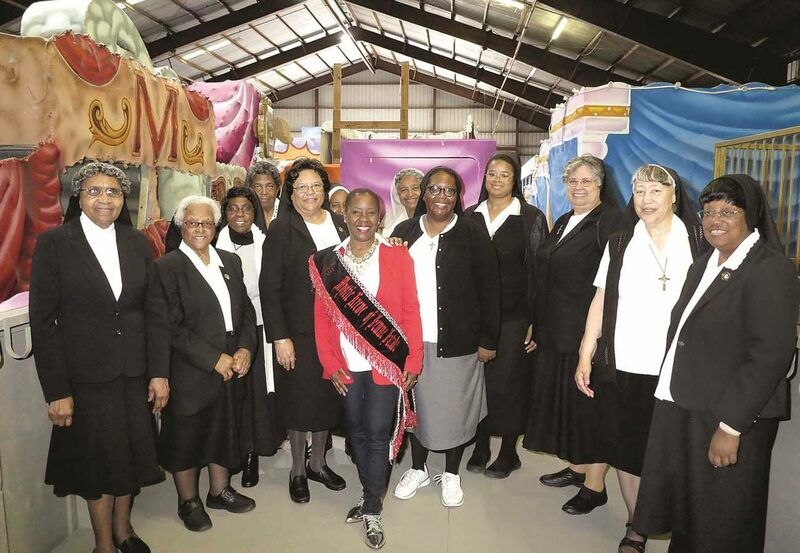 The sisters also will be acknowledged as their float passes the traditional reviewing stands on St. Charles Avenue, where they hoped other members of the congregation unable to ride would be in attendance cheering them on. Sister Greta said he hoped the ride will create more awareness of the congregation’s long history of service to the community and its ministries today that include care for seniors, feeding the homeless and education. She also hoped it will further Mother Delille’s cause. Her sainthood cause was opened in 1988 and was approved unanimously by U.S. bishops in 1997. She was declared venerable in 2010. “Venerable” is the official recognition by the Vatican Congregation for Saints’ Causes of a sainthood candidate’s heroic virtues. In general, in the sainthood process, a first miracle credited to the intercession of the sainthood candidate and recognized by the Vatican is needed for beatification and a second such miracle is needed for canonization. Currently, the congregation is reviewing a miraculous healing attributed to her intercession. If that medical case is not approved, the religious order has another healing being investigated by medical professionals. Sister Greta said one criteria considered by the Vatican congregation whether Mother Delille is known to the wider community. That’s why the parade is a perfect venue. “Parades are part of a celebration,” Sister Greta said. “And I really wanted the visibility of the Sisters of the Holy Family celebrating its 175th year. This parade is going the traditional route down St. Charles Avenue and would give us that visibility. “(We hope) to get as many people as we can to know the life, legacy and history of Henriette Delille and pray for her. I think it will help (her beatification cause),” she said.